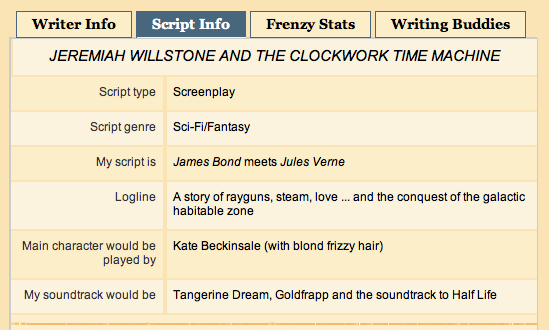 Today I finished the first hundred pages to the screenplay to JEREMIAH WILLSTONE AND THE CLOCKWORK TIME MACHINE, officially winning Script Frenzy 2012! Prevail, Victoriana! I’m super happy about this, of course, but this has been a very interesting experience. Even though I’ve left out much of the story and many of the nuances, the script is coming in massively long – 100 pages translating to about 150 of a 450 page book, probably resulting in a 300 page script with a four-hour running time. I’m learning new techniques to cut things out – breaking things into self-contained scenes which could be deleted wholesale, streamlining conversations, recasting thought as action that illustrates the same point. I probably could easily cut this script down from 100 pages to 70 or even 50 … but then I wouldn’t have succeeded at Script Frenzy. Jeremiah leans back, her eyes narrowing at her companions. Let me guess. He lied. I do love dear Albert, Jeremiah, but the reason I stole your mark was to make a personal appeal. Einstein was about to rediscover the weapon that ended the Civil War. In the Victoriana, the Peerage suppressed that knowledge. The point of the mission was not to steal Austrian secrets, but to convince him to keep them secret. Jeremiah scowls, looking at the both of them. And you kept this from me. The mission was … Need to know. What kind of mad dictator came up with that rule? To confirm what he was up to. The Lady Georgiana had to train me to operate the Crookes counter. 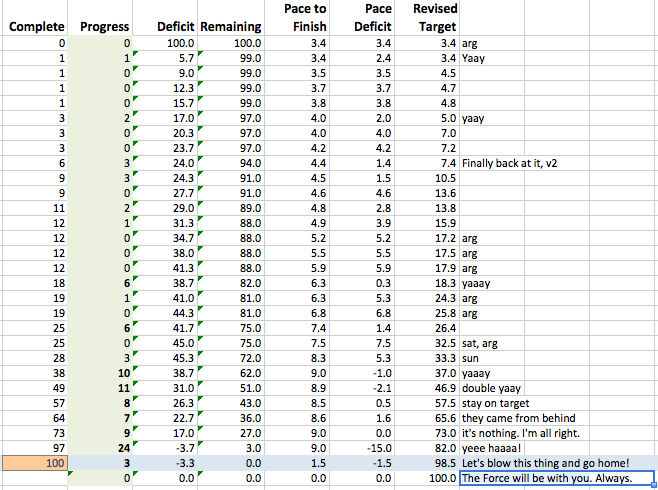 At my stage in scriptwriting, it’s going to be far easier to tell what to leave out after I’ve put it all in. 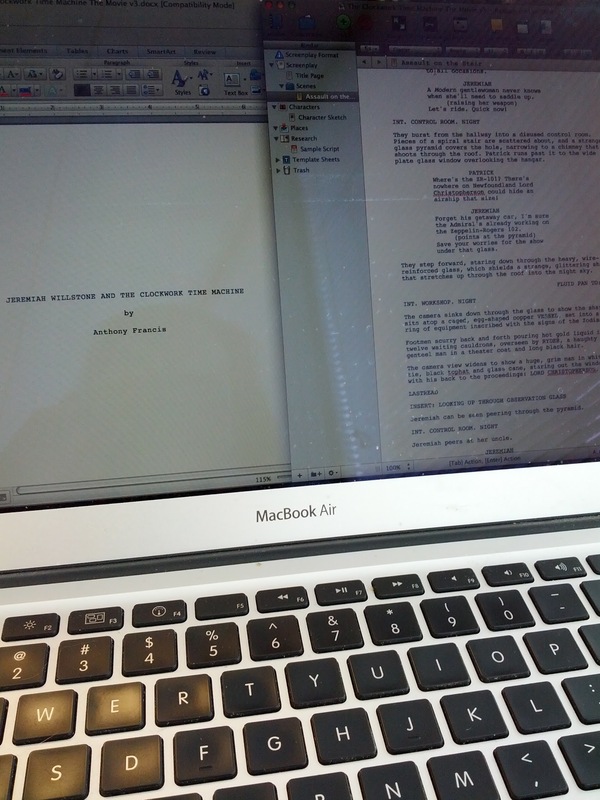 So, even though I’m going to shift gears back to Dakota Frost #3, LIQUID FIRE and the Science of Airships panel at Clockwork Alchemy, my plan is to finish THE CLOCKWORK TIME MACHINE script in its entirety. Then I’m going to cut it mercilessly until it hits a 2 hour (ish) running time. Then I’m going to hold a reading where a group of friends will read the script aloud so I can see how it sounds (a trick I learned from my friend the playwright Jim Davies). And then I’m going to cut it again. 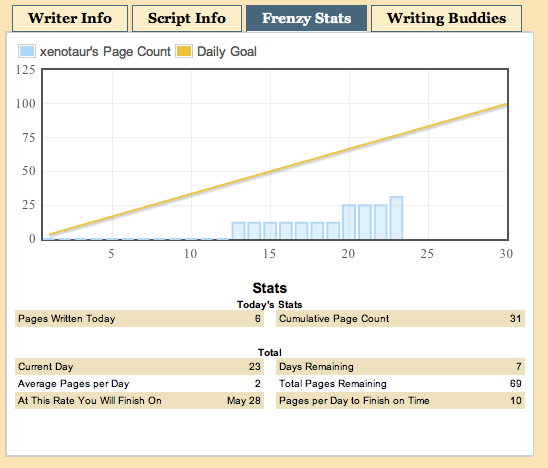 And then Script Frenzy will probably roll around again, as I’ll have to squeeze all the above in around regular work and writing. 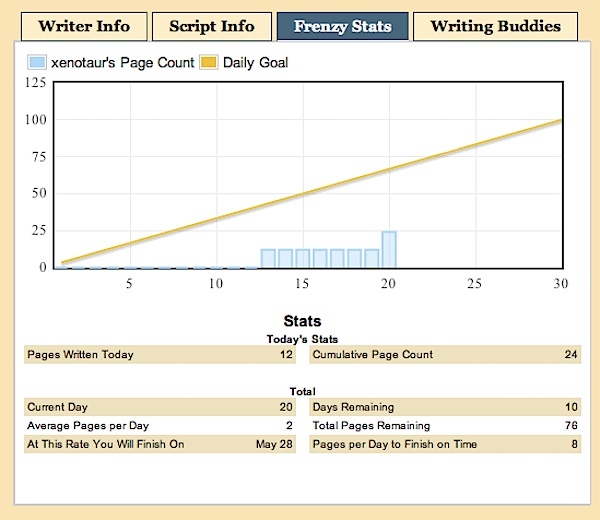 But if I keep at it, after a few years of writing scripts I’ll probably have something pretty tight, something that might actually be salable. 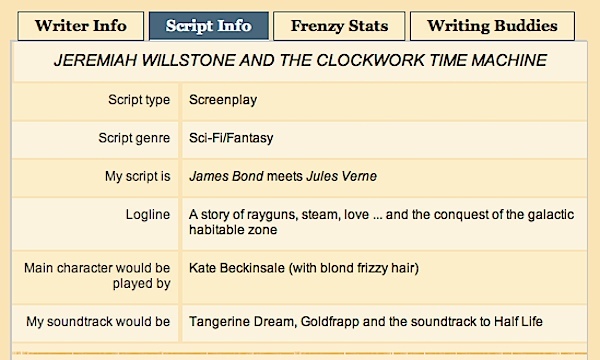 Not that I won’t try to sell THE CLOCKWORK TIME MACHINE, but I won’t let failure to sell the first script I’ve written in twenty years stop me. I’m in this for the duration. 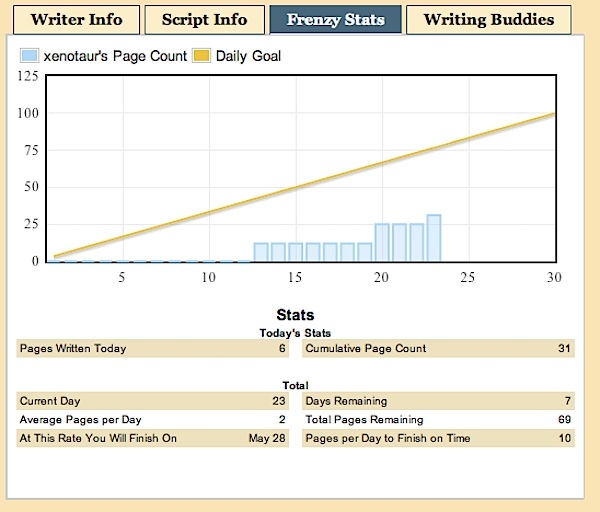 UPDATE: I forgot to mention SCRIVENER. 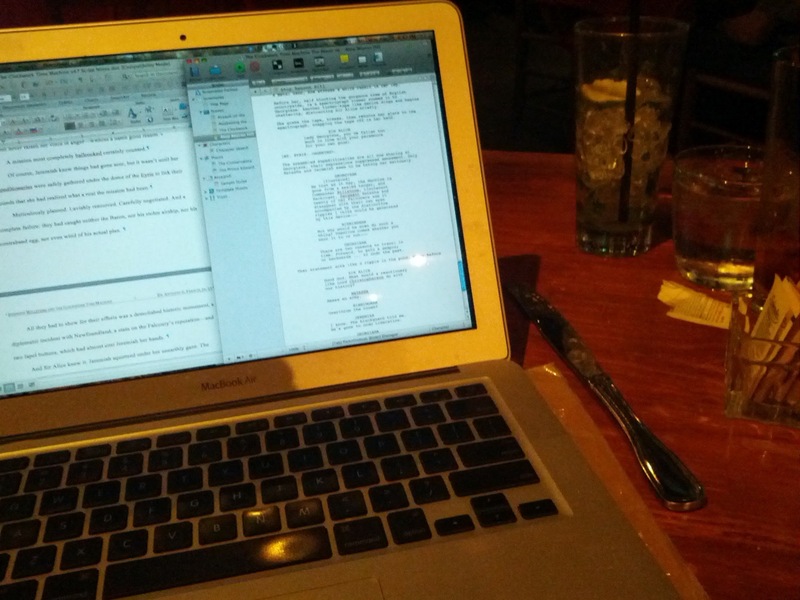 Scrivener, Scrivener, Scrivener: without you I wouldn’t have finished THE CLOCKWORK TIME MACHINE on time. 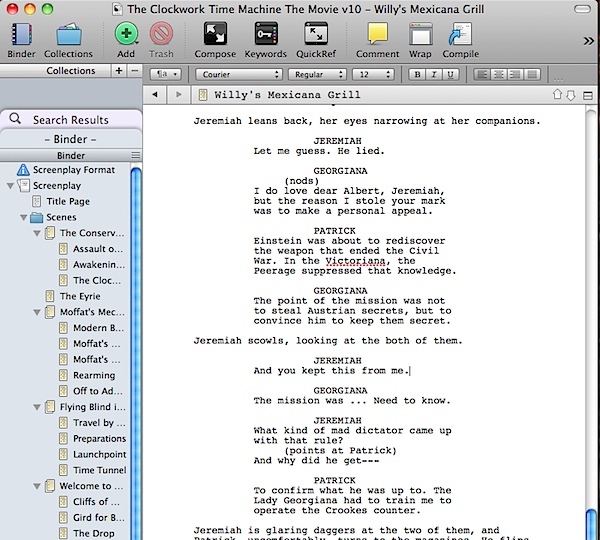 I don’t know if you’ll replace Microsoft Word — I’ve been using THAT for almost a quarter century — but you made the process of producing a script effortless. Thank you. We made it to “back on track”. 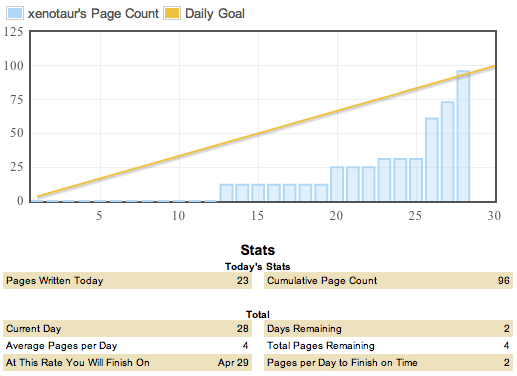 94 pages, which is just enough to finish up by Monday if I do 3 pages per day. I’d rather “finish” Script Frenzy tonight, so I can relax a bit tomorrow and get back to LIQUID FIRE. Let’s see what we can do to do that. Jeremiah arrives moments after Georgiana, who’s wearing a slit-front traveling dress over boots and pants and has a leather satchel. She’s discreetly checking a deranger. Well, Jeremiah, have you everything you need? She dry-fires the deranger, while Jeremiah checks a first aid kit she keeps in her left pocket. Whether I’m to stab or be stabbed for the queen, I’m ready. Is that a literal or metaphorical stabbing you’re hoping for? Patrick arrives wearing an aerograph pack, not unlike a cross between a television and a World War II field radio. You’ve quite taken to that. I should give it to you. Yes, you should. Check your pack? Check your pack, wind your braces, buckle your chin-strap. UPDATE: Taking a break at 96 pages. That should be enough for tonight, and I’ve just about closed down the Coffee Society … but if I get more beans and vinegar, who knows? 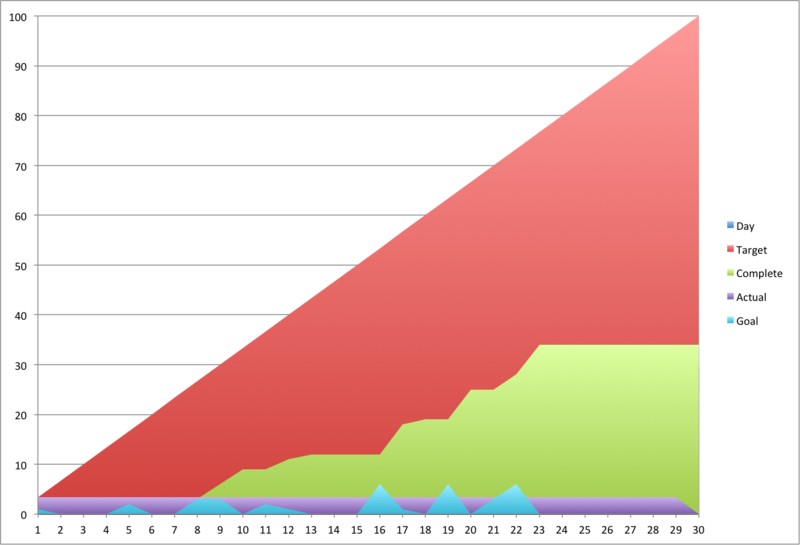 19 pages so far today. 1 and a half pages to go to put me back on the track I should have been all month. Jeremiah looks back at her companions, mouth hanging open. Patrick is struggling with the straps of his aerograph. Oh, I know where we are. But that’s less of an answer than a new conundrum. Harbinger motions to an aeronaut to take his place at the console. Jeremiah leaps down into the navigation trench, art deco glass crunching under her boots. She peers about. Lower us over the shorter tower at our five o’clock. It looks to have a flat roof and a fire escape. She leaps up the stairs and joins Patrick, who is extending his hand to Georgiana — but with his eyes on Jeremiah. Georgiana, as oblivious as Jeremiah, takes his hand and rises, and the three of them are together again. Let’s hope not, you stole from me all the best men. The three of them walk together from the bridge. Here goes nothing. Onward into the seas of time! … 27 left to finish by Monday night. That is all. I’ve done 6 pages of THE CLOCKWORK TIME MACHINE today, double the needed Script Frenzy rate. If only I wasn’t already 40+ pages behind! I don’t think I’ve ever been this far behind on a National Novel Writing Month-like challenge, or with so much else to do in my life. 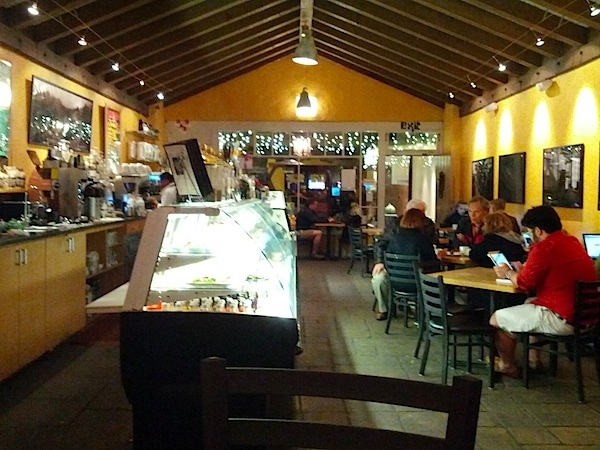 New late-night coffeehouse detected, spouse alerted, necessary emails sent, distractions out of the way. 3 pages to go to get back on target; a magical 4 pages will put me ahead for the day – a pace that can only lead to victory! What would Jeremiah say? Oh, dear God, I’m right. The murmuring now becomes an open free for all. All the characters start speaking over each other. Jeremiah calmly draws her sole working Kathodenstrahl and fires a blast straight up. The unlit chandelier beneath the apex of the dome flickers with lightning and light. Gentlemen and gentlewomen. The Lady Georgiana has identified an a threat to our very existence, and Sir Alice has just confirmed it. She holsters her weapon, then looks at the spectroscope. Sir Alice, I must recommend extreme boldness. INSET: she turns her pliers, exposing five distinct sets of wheels with settings at the heart of the navigear. An imaginary residue, leaving us with a time machine, like Wells’s aerograph romances? Lady Georgiana, you’ve fallen too much in love with young Einstein for your own good! But yesterday doesn’t. If you could travel to the past, there’s a good chance you could change it. Good God. What would a reactionary like Lord Christopherson do with our history? I know. The blackguard told me. He’s gone to undo Liberation. Green crackling fire envelops the whole machine, tinged by a growing blue glow of Cerenkov radiation. The air around the machine ripples, like the machine is dipped in water. Images begin appearing in the rippling miasma: Jeremiah and Patrick, Natasha raising her weapon, a footman falling. It’s clear these are a jumble of events, past and future. That’s more than an air craft. Jeremiah, in a ridiculous dress, half undone, lounges in a punt. She waves at the shore, where Patrick walks with Georgiana, who glares jealously on. Jeremiah plucks a bit of cheese from a basket, strong hands push a pole, and the camera pans back to a young Albert Einstein, similarly disheveled, pushing the punt. What is time, but another kind of space? Ripples in one move us along the axis of the other. Jeremiah looks aside, where a dragonfly alights on a leaf. Water churns around the pole, an eddy catches the leaf, and it is whipped back around the pole as it moves forward. If ripples are time and space, what’s flow? Can we get more time? Must I give up all my secrets? If you want to make more ripples. The dragonfly alights … and Jeremiah takes his hand. Poor Albert! Jeremiah will only break your heart. Onward! I’m so busy I can’t see straight, so that must mean it’s time to take on another project. 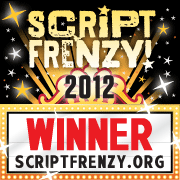 I’m doing Script Frenzy this month, a challenge to write 100 pages of a script in 30 days, much like National Novel Writing Month, only for film. A mammoth complex looms in the night, an airship hangar made of glass attached to a hulking Victorian palace. Lightning reflects off the glass of the hangar — then flashes of light appear inside the windows of the palace. More flashes illuminate a long, narrow Victorian staircase with wainscoting and elaborate rails. A figure hurls herself backwards down the stairs, firing electric pistols from both hands as she bumps down the steps on her rear, sliding on her tailcoat. JEREMIAH slams into the base of the stair, gritting her teeth, keeping both guns trained back the way she came. She wears a long tailcoat, an black corset vest filigreed with gold wire, and a pair of airman’s goggles on her forehead. At the top of the stairs, crackling green foxfire ripples over the metal bands of the stout wooden door. Holes are blasted in it, and light shifts behind them, but JEREMIAH has no clear shot. She sees sparks coming from her left gun, and tosses it aside with a curse. She glances at her right gun, seeing the indicator bead hover between three and four notches. A creak upstairs refocuses her attention. Jeremiah murmurs to herself as she focuses on the holes in the door. Very well, sir, show yourself. Three shots? I’ll get you in one. Here I mumble “J Michael Straczynski’s the Complete Book of Scriptwriting,” “The Empire Strikes Back Fascimile Script,” “other writing resources I’m too tired to mention”. What? I’m only 9 pages in when I should be around 33. Back to work!